The following are just some high points in the development of Park Nicollet Medical Center. The whole story is in the book Managing Change, Changing Medicine, by James R. Hare, Jr. (1996). There is also an account in “An Historical Review of Park Nicollet Medical Center” in the Park Nicollet Medical Foundation “The Bulletin,” Vol. 33, No. 2, 1989 (on file at the SLP Historical Society). That account was written by one of the original doctors, Dr. Robert A. Green. Also see the clinic’s web site. ALL THE WAY OUT THERE?? In 1949, Nick Phillips had contemplated building a medical center at his site at the Lilac Way Shopping Center, and Surgeon Richard J. Webber jumped at the chance to start a medical practice in the suburbs, but the deal fell through. On June 28, 1950, the Dispatch announced the beginning of the St. Louis Park Medical Center. Morten Arneson agreed to give a group of (then)10 doctors a 99-year lease for the western portion of his three-acre nursery, including a 100-ft. frontage on Excelsior Blvd. The project was started by a group of WWII Veterans, who had all been working at the Veterans Hospital, each with a different specialty. The Dispatch reported that they were all married, all trained at the U of M, were between the ages of 30 and 34, and had a total of 25 children. The doctors pooled their Veterans’ benefits in order to obtain a construction loan, and the first building of the St. Louis Park Medical Center was built at 4959/4961 Excelsior Blvd. It was designed by Long and Thorshov, and cost $100,000 – plus $50,000 for equipment. The building originally had no air conditioning. On July 2, 1951, the St. Louis Park Medical Center opened for business, seeing five patients and making $16. In 1953, Arneson closed his nursery and moved to Edina. He offered to sell his remaining Excelsior Blvd. property to the clinic, but they declined, so he built a grocery store on the rest of the site at 4951 Excelsior Blvd., on the corner of Excelsior and Quentin. 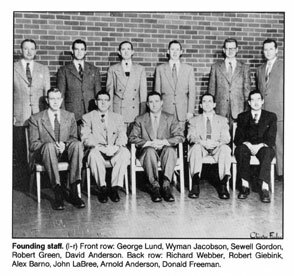 By 1956, the Center had 17 doctors and added a $100,000 addition to the original building. The first doctor to come after the original 11 was Dr. Al Schultz. The next was Dr. William Fifer in 1956, followed by Dr. Cushing. In 1960, the St. Louis Park Medical Center Research Foundation was formed to promote medical research and community education. In 1961, there were 24 doctors on staff; the total staff of 100 served an average 300 patients a day. The Center required more and more room as the practice expanded, and in June 1966, it was authorized to purchase the six-acre site of the Beltline Pay Dump, across Excelsior Blvd. The new building was designed by architects Setter, Leach & Lindstom, Inc. It was first constructed with five stories and a shelled-in sixth. Construction by the Knutson Const. Co. began in September 1967. The move to the new building was completed on December 15, 1968. 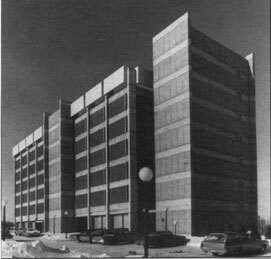 The Northland Building, now known as the 3800 building, was dedicated on January 18, 1969. It eventually grew to seven floors, the tallest building at the time in St. Louis Park. Its original address was 5000 W. 39th Street. In 1977, an adjacent structure, the Arneson Pavilion, was dedicated to Morton and Katheren Arneson. It was originally two stories, located just north of the Northland Building. This is now known as the 3850 Building. 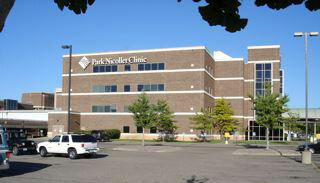 On August 2, 1983, the St. Louis Park Medical Center merged with the Nicollet Clinic to form the Park Nicollet Medical Center. The Nicollet Clinic had started in 1921, also by doctors from the University of Minnesota Medical School. 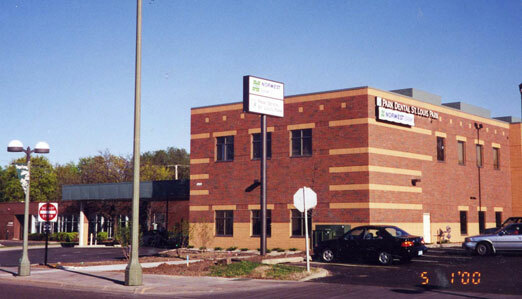 The Clinic was originally located at Nicollet Avenue and 11th Street, then at the corner of Franklin and Blaisdell. 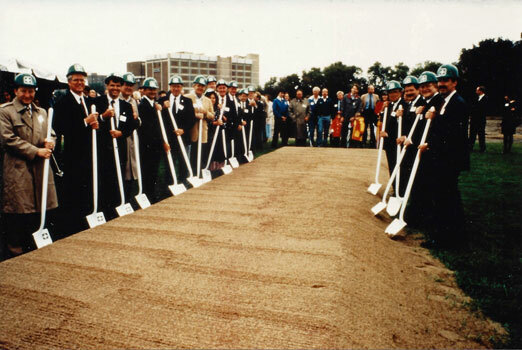 On October 12, 1983, a groundbreaking was held for a five story addition to the Arneson Pavilion. Park Nicollet originally wanted to build a new building on the site, but the Minnesota Pollution Control Agency required long term remediation to prevent hazardous compounds from going into surface and groundwater, so they built up instead of out. The new North Tower was dedicated on September 7, 1985. On September 22, 1993, ground was broken for two new buildings that were part of the Tower Place redevelopment effort that replaced Lilac Way. This photo, donated by Mrs. Lyle Hanks, is believed to be of the 1993 groundbreaking. A two-story building was built for primary care and is now referred to as the 3850 building. A five-story building houses surgery and opthamology (the 3900 building). The grand opening of these new facilities was held on April 25, 1995. The original site of the St. Louis Park Medical Center was demolished and rebuilt. The new building (shown in 2000) houses a bank and dental office, among others, and is owned by the owners of Miracle Mile. Also see article in Re-Echo.